Whenever Argentina striker Gonzalo Higuain pop up in transfer chatter, we laugh a little. 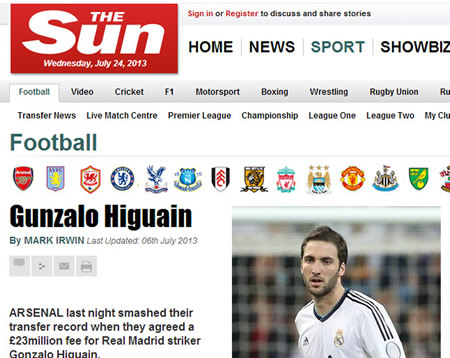 It’s been five years since the Sun told its readers that Arsenal had “smashed their transfer record” and signed Higuain from Real Madrid for £23m. On 27 July, Napoli signed Higuain. Today’s Higuain transfer news comes to us via the BBC, which hears the player say the Premier League “fascinates me a lot” and links him with move to Chelsea. Gonzalo Higuain has fuelled the speculation that he could be leaving Juventus by saying he ‘would love to play in the Premier League’. The Argentina striker has been on Chelsea’s radar this summer and has already reportedly been offered to the west London club. Italy’s Corriere dello Sport says Juventus will let Higuain leave if they can sign Bayern Munich’s Robert Lewandowski. But that won’t happen because one Spanish website says the Pole has agreed to join Real Madrid. But the Sun says Lewandowksi’s decision to leave Bayern “is a massive boost” to Chelsea. Which means, presumably, that Higuain stays at Arsenal?